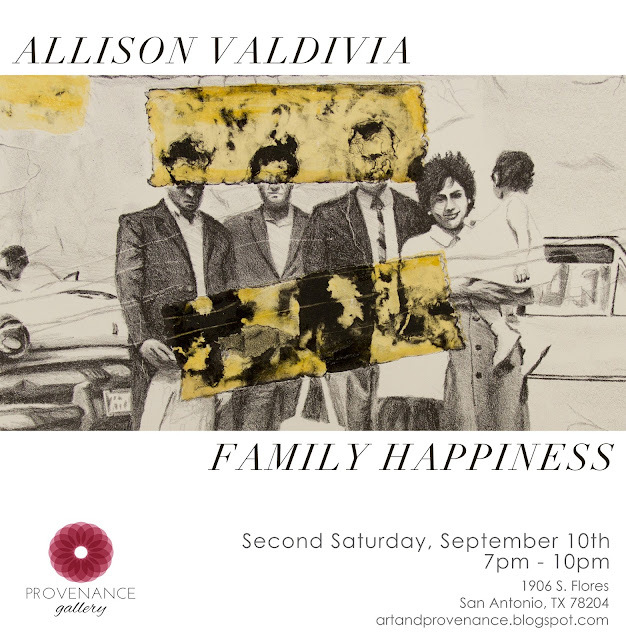 Provenance Gallery is pleased to present Family Happiness, an exhibition featuring the work of Allison Valdivia. By viewing old family photos as artifacts, Valdivia creates her own stories, projecting hidden philosophies based on personal experience, on what she sees in the object before her, and from the lack of family history shared with her. She asks the questions: What is a family? What makes a family? The photo presents and depicts the idea, but by asking these questions, Valdivia goes beyond the surface of the image of the “happy family” by playing up particular emotions hidden within the photo. Valdivia aims to find her answers by creating images that depict a story forgotten or withheld. Allison C. Valdivia is a visual artist and former military brat who found her way to San Antonio, Texas. She received her Bachelor of Fine Arts degree at the University of Texas in San Antonio, graduating in the Spring of 2016 with a concentration in Painting/Drawing and a minor in Art History. Her work has been exhibited throughout San Antonio at R Space, High Wire Art Gallery, and The San Antonio Art League Museum. She was featured in UTSA’s College of Liberal and Fine Art’s 30th, 31st and 32nd Student Art Exhibition at UTSA’s main gallery. Recent exhibitions include Print Austin’s “The Contemporary Print” exhibition at Flatbed Press + Gallery, curated by Mary Heathcott, executive director of Blue Star Contemporary Art Museum and Delta National Small Print Exhibition at Bradbury Art Museum, Jonesboro, Arkansas, jurored by Dennis Michael Jon, Associate Curator of Prints and Drawings at the Minneapolis Institute of Arts. Exhibition will be on view until September 30th, by appointment. For more information, please contact Stephanie Torres at stephtorressa@gmail.com.